Momma Told Me: The best kind of drink is one with friends. No, I didn't bump my head and forget the date, I'm aware the 4th of July holiday has come and gone. However, in our family, we firmly believe that every day of the year is just as good as the last to celebrate our freedom and the Red, White, and Blue. Okay, okay, so my cousin might have been trying to be just a *little* bit frugal when she planned her hubby's 'Getting Out' of the military bash the week following the 4th. Regardless, we hold a strong sense of how lucky we are to live in this great country; my grandfather gave 20+ years to the Navy, and we consider it a family commitment when one of us serves. 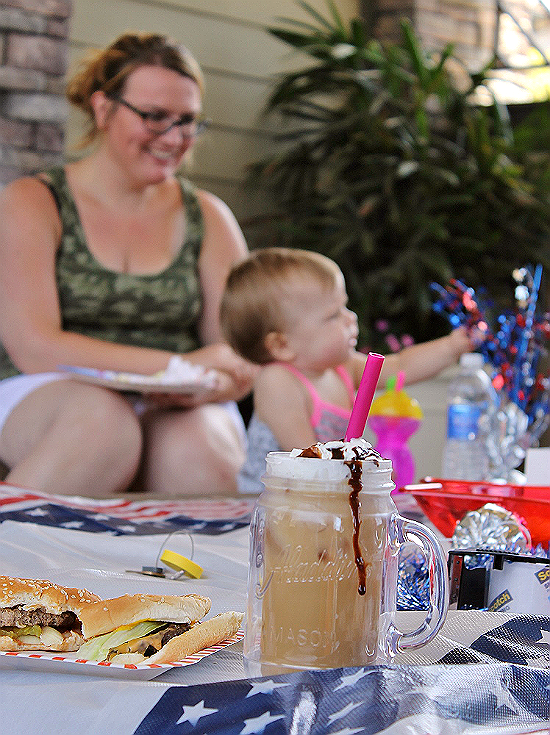 And that's precisely why we pulled out the best K-cup flavors to brew over ice, poolside, with family and friends. We live in a town attached to the Port Hueneme, CA Naval Station; so the best part about planning this party was knowing all of Cory (the guest of honor's) friends would be able to attend. Unfortunately that also means that many friends and families often have to move around as they are re-stationed and even released from service. This gathering ended up serving multiple purposes as pregnancies were announced, impending due dates were celebrated, and moving dates were discussed. It was also a time to reflect on Cory's 14 years of service which included 2 army accommodation medals, 3 navy achievement medals, a combat action ribbon, and multiple deployments. My cousin, Savannah, who is Cory's wife (and Sabrina's mother) also happens to be 8 months pregnant, and I was not about to let her tackle this party business on her own. The men were promptly put in charge of grilling, while I stepped in with an ingenious idea to keep our guests hydrated on a budget, with plenty of variety. As a woman who takes her cold beverages very seriously, my kitchen is outfitted with 2 Keurig single cup brewers- which do so much more than brew coffee, my friends! 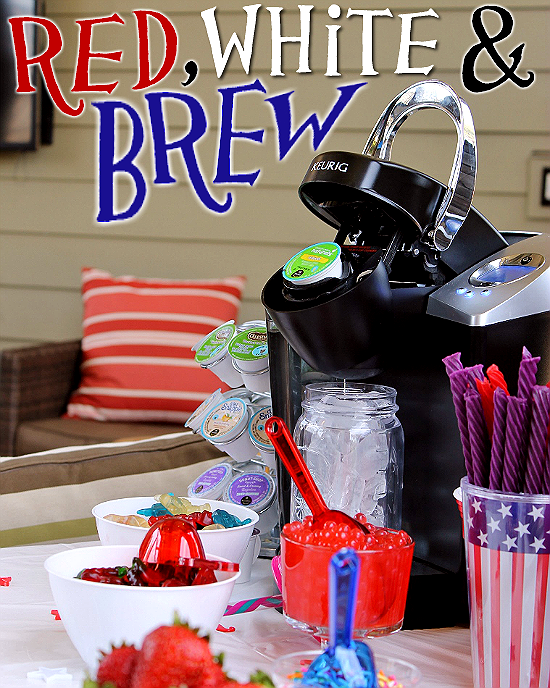 Armed with an extension cord, the best #BrewOverIce K-Cup flavors from Walmart, an ice chest, and my Keurig we set up a drink station to satisfy even the pickiest guest. 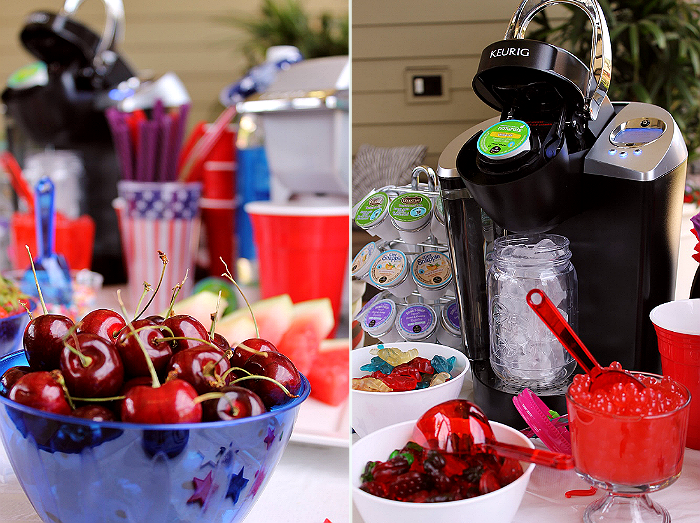 I'm telling you, I don't think I will ever throw a party without my Keurig again! Because we were going to have so many youngsters running about (they outnumbered the adults) I picked up plastic mason tumblers at Walmart to #BrewItUp with. 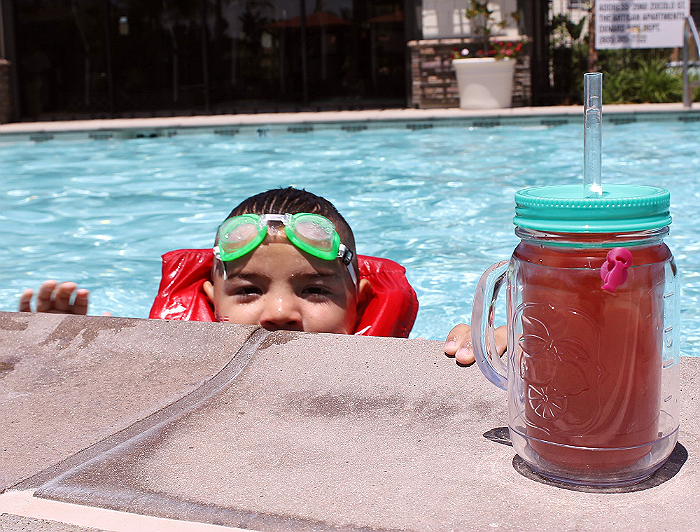 Their screw on lids and different colored straws and caps made them easy to keep track of poolside. Of course the kids were most intrigued by the "magical drink machine" (not my words) and I was happy to let them brew over ice with adult supervision. After all, it's as easy as filling a cup with ice, choosing delicious K-Cup flavor (like Green Mountain Organic Lemonade or Snapple Peach Iced Tea), closing the Keurig lid and pressing your brew size. Check out the simple how to make iced coffee video! For the kids we chose to brew with the largest brew option, which dispenses more liquid from a single cup. This cut down on any sugar content and made the drinks last longer in tiny hands. For our Donut Shop Sweet and Creamy Iced Coffee, we brewed on the smallest setting for maximum flavor. 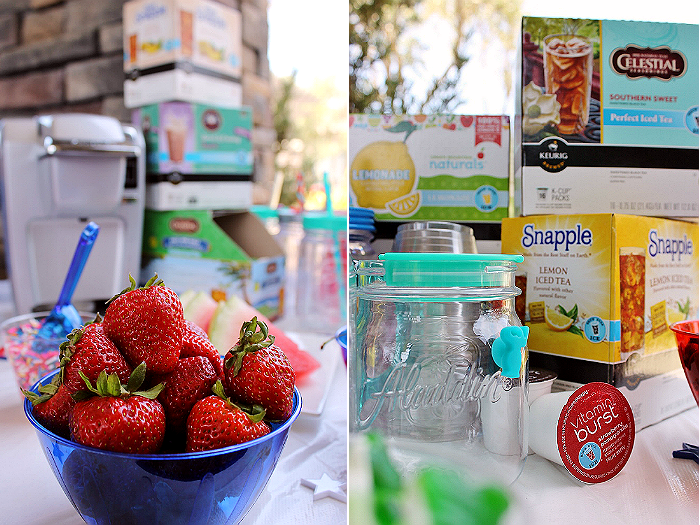 Our drink station was filled with bowls of scrumptious add-ins for all beverages including gummy worms and strawberry popping boba for the kiddos, and plenty of fresh fruit for lemonade and iced tea. 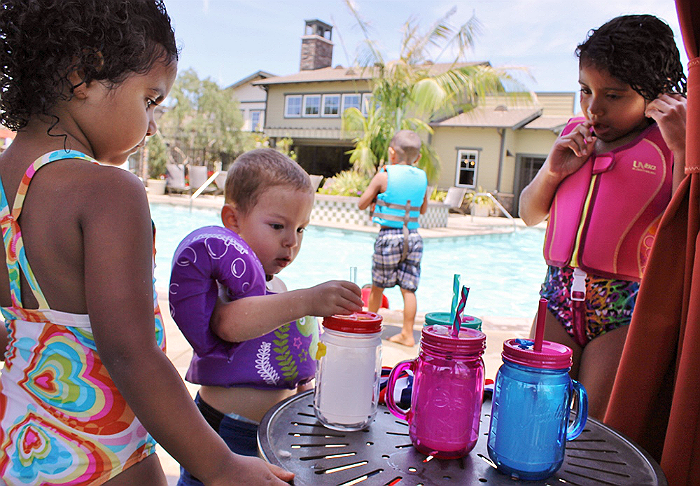 As it turns out the Brew Over Ice Vitamin Burst Strawberry Pomegranate flavor was most popular with the kids, who stole sips from mine poolside in between gulps of their lemonade. My favorite part of the afternoon was just sitting back and people watching with my new camera. I was happy to chronicle some of the more candid moments of the numerous families in attendance. We had children from baby to age 13 in attendance, and it was magical to see how well they all got along. In fact us adults even had time to reminisce about some of the crazier days (pre-children) and discuss plans for the future. Now that Cory is acclimating to being a civilian again his growing family has many options before them; some of them scary, but most of them exciting. It was great that we were all there to support him and reaffirm the bond we all share! Of course the party wouldn't be complete without cake; and the kids weren't about to let us forget that there was a giant box full of red, white, and blue cupcakes sitting on the table. Sugar was demanded before they returned to the pool, but only after all plates were presented clean (we must be horrible parents insisting our kids eat their hamburgers and hot dogs first!) I caught the above moment on film as toddler, Jake, attempted to get more cupcake inside his mouth than outside. As the party wrapped a few guests attempted to walk off with my Keurigs, people rushed to fill their tumbler with their favorite iced tea before hitting the car, and several rounds of hugs were exchanged. Jay and I stayed latest to help clean up as the guest of honor took a load off from all his hard work at the grill (and tossing kids into the pool.) And that's when I snapped these final shots of Savannah unscrewing her lid to get the last few drops of lemonade and iced tea from her tumbler. 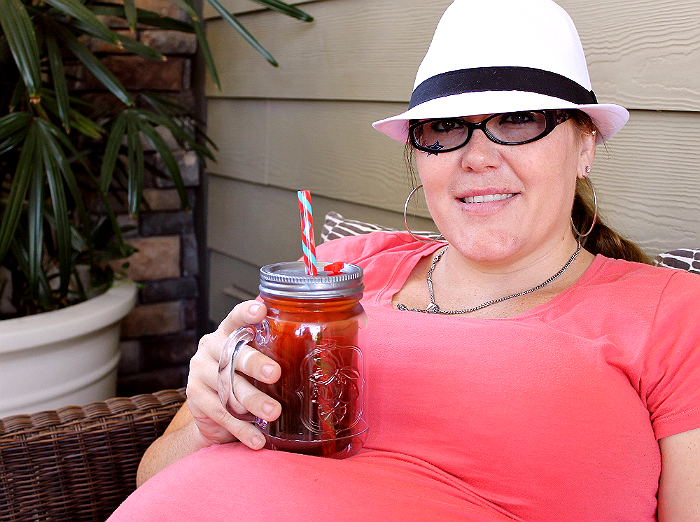 Pleasing a hormonal pregnant woman? That's a success in my book! What Daughter Says: Memories can be made over lemonade and iced tea, just add the right people! 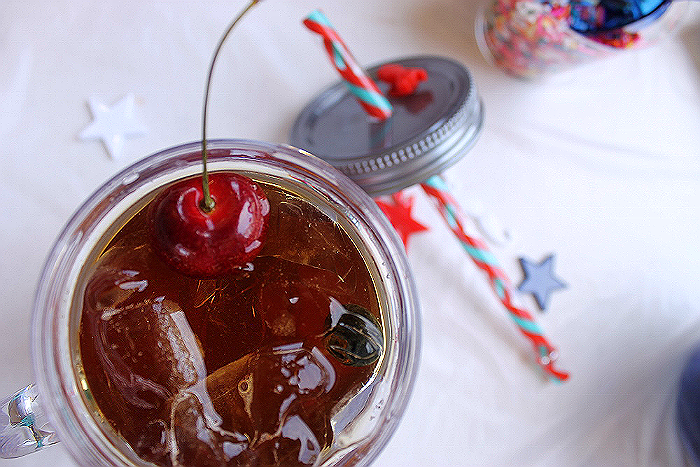 Explore our photo album below for an inside look into our Red, White, and Brew party! I would love to own a Keurig someday - I'm not a coffee drinker but I do like tea, lemonade, and other cold drinks. Looks like it was a delightful family reunion/celebration. 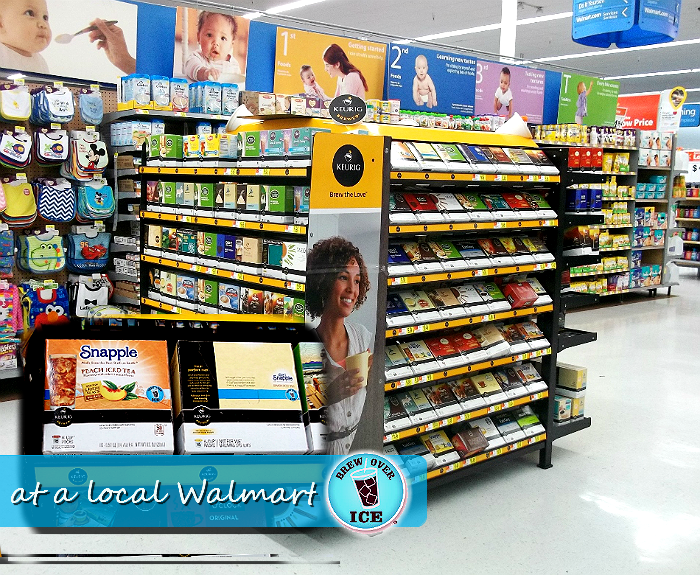 The Keurig sure made it easy for everyone to have a delicious cold drink of their choice. What a great party. Looks like everyone had a blast. I love the slide show too. I love that Keurig is now so much more than just coffee. Such a good idea to take the Keurig to a party. That way everyone can have what they want, when they want it. Congrats to Cory on his years of service -- what a tremendous sacrifice! I'm OBSESSED with my Keurig! We got it as a wedding shower present last year and it's one of my prized kitchen tools! Our relatives have a Keurig, and we love to use it when visiting. I've never tried making an iced drink with the Keurig though. I bet it's great during these hot summer months. It looks like it was a big hit at your party! I love how Keurig is now designed todo so much more than just brew single cups of coffee. It looks like you guys know how to get down and have a great time. What a great post. Your photos are awesome! We don't drink coffee or tea, but doesn't Keuring offer cocoa. Would love to have one for the winter months.